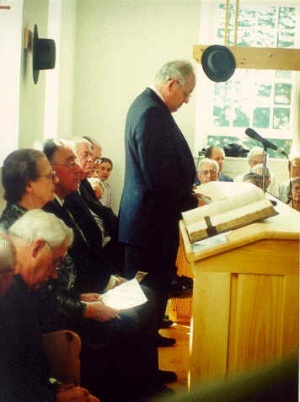 John Ruth behind long pulpit at dedication of the restored Detweiler meetinghouse, Roseville, Ontario in Sept. 1999. In the early days the Mennonites in the eastern United States seated their ordained men during the Sunday service on a long bench at one side or end of the meetinghouse behind a table. Later, when a pulpit was introduced to replace the table, it was made of sufficient length to completely cover the bench. From this bench (1) the deacon rose to conduct "the opening," i.e., to read a Scripture, offer comment, and lead in prayer; (2) the preacher appointed for the morning rose to preach the sermon; (3) all other ordained men present "gave testimony," seated, in order of seniority. Thus all the men "on the bench" took part in every service. The term "the bench" came to refer to the official ministerial body of the congregation including bishop, preachers, and deacons. To be "on the bench" came to mean to have official responsibility in the congregation, and an ordained man who moved into the congregation was not "on the bench" until officially voted in by the congregation, and might remain "off the bench" all his life. The "bench" is not a formal official term, but only a customary expression. It was in the 1950s, however, still commonly used in the Lancaster, Franconia, and Washington-Franklin (MC) conference districts as well as by the Old Order, Stauffer, and Reformed Mennonites in the United States and Canada. It is used only in the absence of a one-pastor system. Bender, Harold S. "Bench." Global Anabaptist Mennonite Encyclopedia Online. 1953. Web. 21 Apr 2019. http://gameo.org/index.php?title=Bench&oldid=103807. Bender, Harold S. (1953). Bench. Global Anabaptist Mennonite Encyclopedia Online. Retrieved 21 April 2019, from http://gameo.org/index.php?title=Bench&oldid=103807. Adapted by permission of Herald Press, Harrisonburg, Virginia, from Mennonite Encyclopedia, Vol. 1, pp. 272-273. All rights reserved. This page was last modified on 21 November 2013, at 19:14.